View your hardware in the Channel Specification to begin configuring and managing the signals in your system. 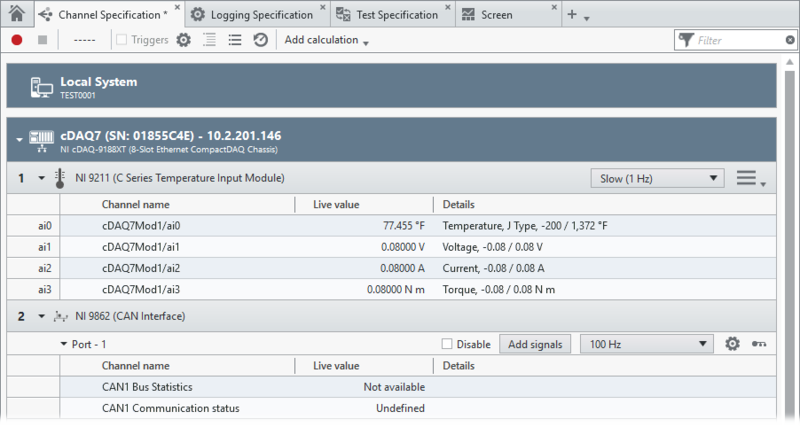 FlexLogger automatically discovers any installed hardware and displays it in the Channel Specification. Available device channels will be listed beneath the module information. CompactDAQ modules will show the model name and number along with the slot they are installed in. CAN devices will display all available ports, and added channels will be listed beneath the device port information. Troubleshoot any hardware missing from your project. When your hardware has been discovered and appears in the project, you can configure device channels.